First up on the mini feature is my little brother!!! My youngest brother, Veyron, has been to a few conventions with me but he has never competed with me on the big stage. 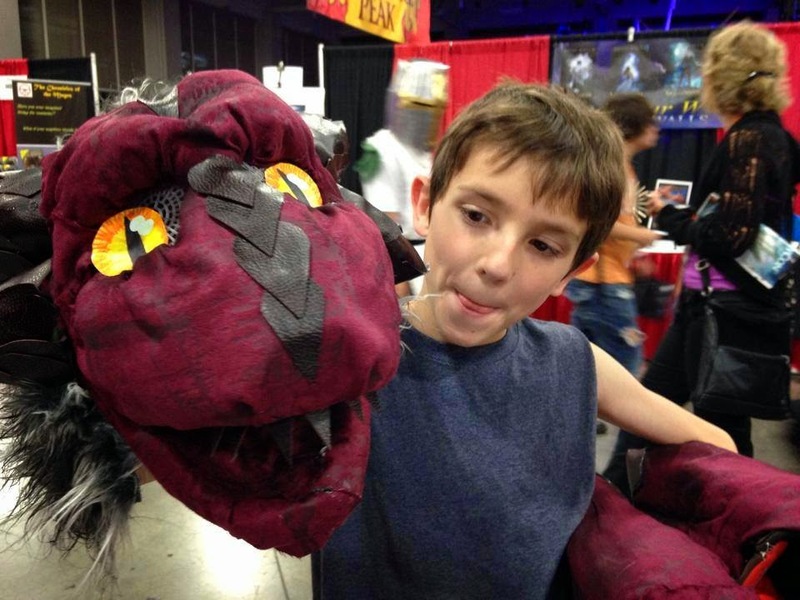 We decided a few months before the convention to try and make a Wyvern costume for him. We came up with a skit and took off with the idea! Please note: I have never made something so intense in my life!!! I am very proud of the hard work my brother help put into this. and painting of the fur and fabric. I worked very hard and might have over stressed myself, but when we found out we could compete on stage my brother, Veyron, just started jumping and wanted to get in his costume again. It was worth all the hard work right there. He was so happy to be on stage and I was so happy to be up there with him. We might not have won anything but I know my little brother will never forget this. He was so thrilled!! Oh no! The wyvern is going to eat the elf!! Veyron as the Wyvern and VFire as the elf. The crowd roared when Veyron made it on stage and opened his wings. He was so adorable!! Oh, he is a nice wyvern! Our characters are original characters that like to roam the hot southern deserts. Guster, the wyvern, likes to hang around volcanoes and is a lava dragon! He likes to chew on lava rocks. Veria, my elf character, is his friend and together they search for hidden treasures in the desert. Our skit was when the two first meet and the wyvern ends up being a nice critter instead of a deadly hunter. Special thanks to my mom for letting me kidnap this kid for a few weekends to work on this and cover her kid in glue once... And to my siblings Lexus and Sterling for helping sew and paint everything. I owe you guys!! Tune in tomorrow night for more costumers!!! There are some pretty awesome ones to see! Con Review Con Stories Mini Features! Labels: Con Review Con Stories Mini Features!